Abstract: Computers are a perfect fit for the entertainment room, and building a home theatre PC is not more difficult than assembling a standard system - as long as you have the right components for the task. 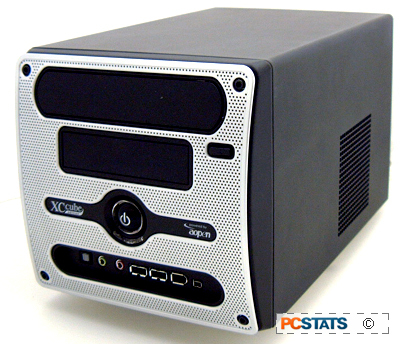 Fortunately, case manufacturers came to the rescue with a variety of Small Form Factor and stereo-like desktop cases and barebones systems in which to hide your computer's true nature. These days there's no reason at all why a PC shouldn't be just as at home in the family room as it is in the office. In this Do-It-Yourself Guide, PCSTATS are going to walk you step-by-step through the process of assembling your own home theatre PC out of contemporary components. We'll also explore the various things you can do with an HTPC after it's built. For the purposes of this article, we're going to be using the Aopen E915 XCube SFF PC case. While it doesn't exactly resemble a piece of stereo equipment, it fits the bill as small, classy looking and unobtrusive. This was the PC we used to test the 61" Samsung DLP TV since its bezel matched that of the HDTV. 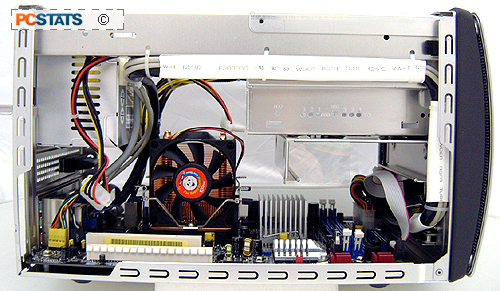 Inside, the Aopen XCube features an Intel 915G-based Intel Pentium 4 Socket 775 motherboard with a nice quiet custom cooling solution, both of which make it a good candidate for an HTPC (or should that be an 'SFF-HTPC? ').